The jewellery here has been created using Swarovski Crystal and Pearls. Swarovski Crystal Pearls are absolutely stunning and have been specially created to look like real pearls. 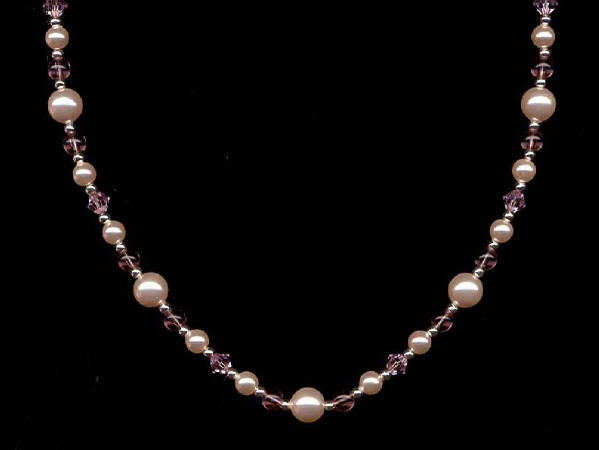 The great thing about Swarovski Crystal Pearls is that they are very durable. They are resistant to scratches and abrasions, UV light, perspiration, and perfume. There are currently 15 items on this page. with Silver spacer beads and clasp. This would be a beautiful bridal necklace. Full view of previous item. on bright pink Tigertail with a silver clasp and 2inch silver extender chain. Length 16.5inches including 3.5inches of beads with 1.75inch central drop. Sorry - the earrings are no longer available. If you like this choker but would prefer different colour crystals, please enquire. Length : 17.5ins with a Silver clasp. and zircon blue bicone crystals. with liquid Silver tubes and clasp. A perfect necklace to compliment that little black dress. black Swarovski Crystals and tiny silver beads. Length : 18.5ins with a Silver clasp. These are a great little idea. Hang one in your car, in a window, on plants, on your mobile phone or anywhere else you want to admire them. Overall length approx. 7inches with a 3inch hanging loop. Shown here in, from left : Fluorite or Rose Quartz, both with a Clear quartz nugget and Swarovski crystals. These are currently out of stock, but please enquire and I can make one in your own choice of stones, which may differ slightly from the image.